I'm leaving for Chicago soon! Can't wait for piles of deep dish pizza, hot dogs, and probably other local goodies after I get there! Any recommendations? Any "must-have" dishes? Wait! What about Mister who is gonna be left home alone without any food? Hopefully it'll last him a few more days before I'm back! This dish, (or dishes, you'll find out later on) was made from a little bit of everything left in the cabinet..
Good thing it ain't taste that bad! Besides, you only need microwave to make it! How convenient is that! If you can't find soup base, a smaller portion of soy sauce will do. Remove the stems from the mushrooms and soak them in the water mixture for at least 10 minutes. 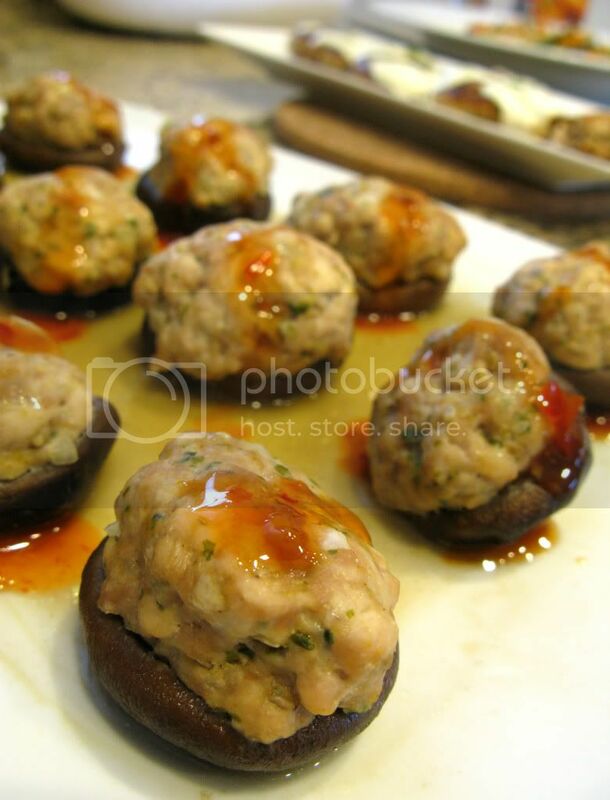 Form the pork mixture into small balls and press them into the center of the mushrooms. Into the microwave and start cooking it! 6 minutes for my microwave (medium-high power). Beeeeeeep!!! Not even enough time for me to wash the dishes and my food, oh no, mister's food is done! Just drizzle some Thai chili sauce over it and there you have it! I also had some leftover pork mixture so I just formed them into smaller patties and seared them till fully cooked, about 2 minutes on each side. That's your instant hambaku sauce! I think Mister at home won't be starving for sure. Meat filling stuffed on top of a vegetable is so yummy :). 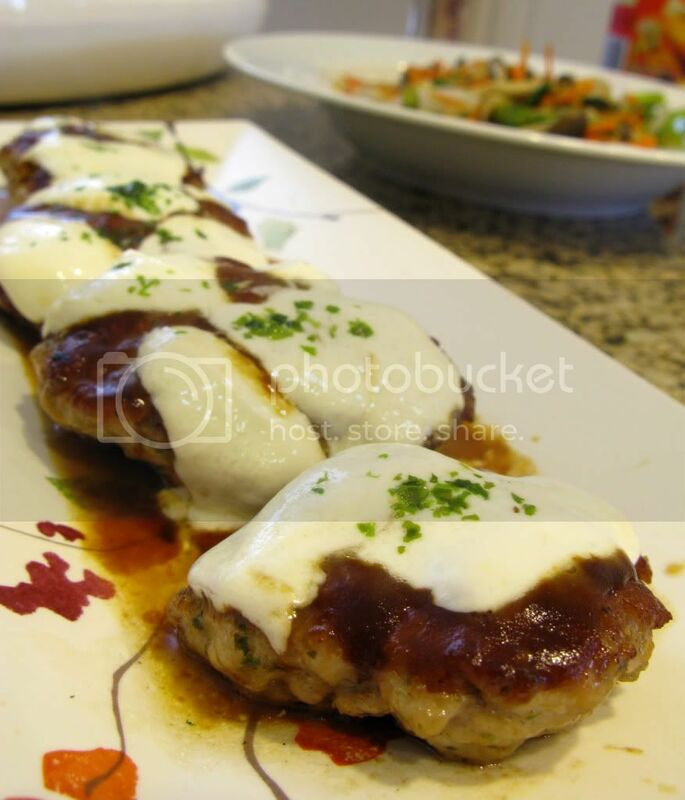 I like doing it with eggplant and then steaming it, but have never tried it with mushrooms! Will need to try this out. Your microwave melts cheese so nicely :). Yeah I was "lazy..." so I used the microwave instead! Eggplant! I haven't had that for a while...missing it so much...(mister at home absolutely hates eggplant). Lovely photo! Sounds like a delicious recipe. I love mixing leftovers up to come up with a totally new dinner! Get a "Chicago-style hot dog." They're very tasty! I hear they're also known for their sausages and barbecue. Will you be going to the Field Museum? It's magnificent! Take care, and thanks for sharing these tasty dishes. To Mushrooms Canada~ Utilizing leftover stuff can also save a lot of money!! To Ivan~ I'm going to that museum on Thursday!! Thanks for the recommendations! Will post the pics on FB later on! !